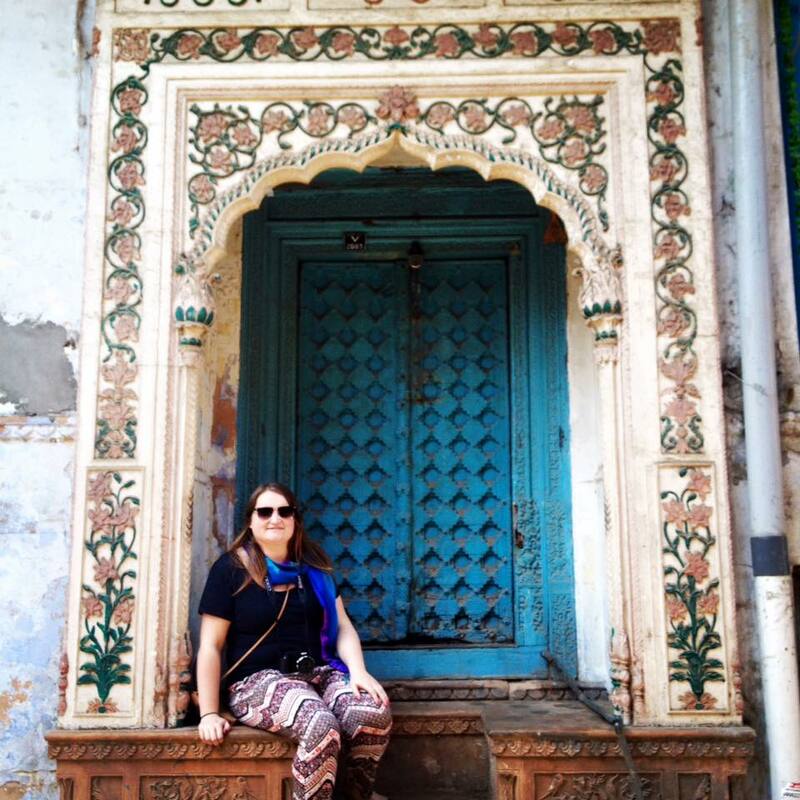 My Indian Adventure – Highlights of Delhi – Where's Clair? So we’ve just been through day one, my journey to India and my trip to the amazing complex of Humayan’s tomb. It would be impossible for me to go through everything I did during my few days in Delhi, so here are some of the highlights, in no particular order of course! One of the things I love to do when I travel, is to meet the local people and to learn more about their way of life. Anyone who has seen the film, “Slumdog Millionaire” will know about the plight of India’s street kids. I was intrigued by this project, because it trains former street children to become tour guides and sets them up for a career in the tourism industry. Many of the guides had gone on to gain scholarships in Universities around the World. We arrived by Tuk Tuk and our guide greeted us and told us the story of how his family had sent him to Delhi to get an education as there were no schools where he came from in the North East of India, close to Nepal. We were guided through the Old town of Delhi, learning interesting facts about the city’s history. 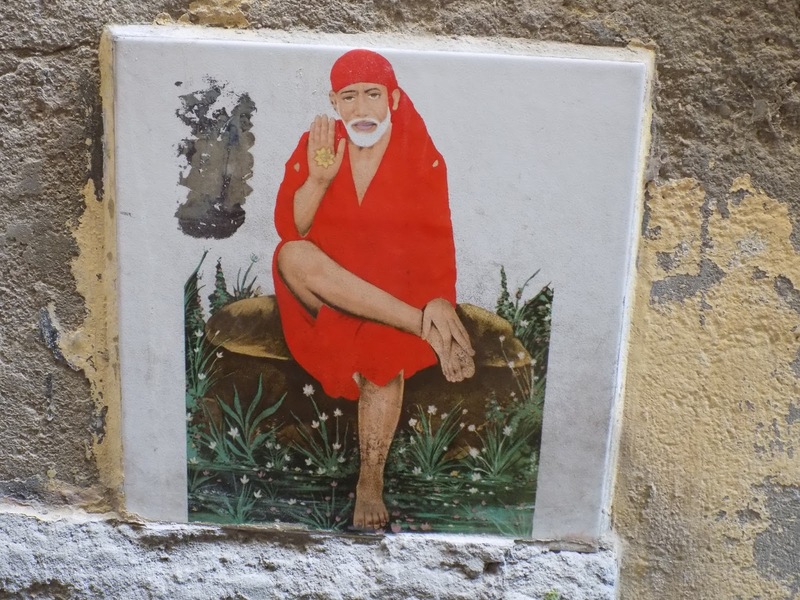 One of my favourite facts, was how the tiles of various religious idols, were not for people to pray or worship, rather to stop them from urinating against the walls! An interesting reason for these idols! We visited the local children’s project, where the kids sang a Hindu prayer for us and after excitedly shook our hands and asked our names and where we came from. After this we took a walk through Old Delhi and I was amazed by some of the beautiful doorway arches and unexpected architecture. An exciting aspect of India is how the many religions live side by side and respect each other’s faith. 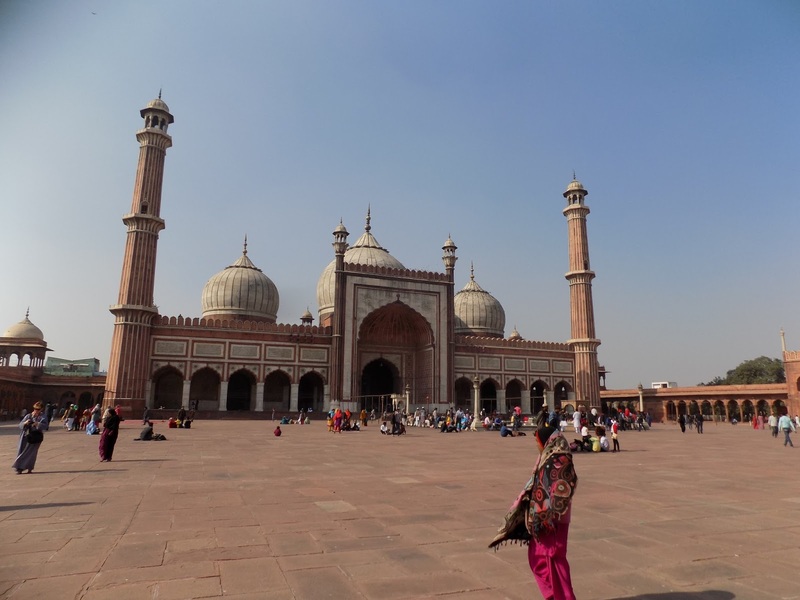 I have travelled widely, but the Jama Masjid, was the first Mosque I have ever entered. A huge complex, built with red sandstone and white marble, it is one of India’s largest Mosques. It is also know as the “World-reflecting Mosque”. The mosque was the site of two attacks in 2006 and more recently in 2010. 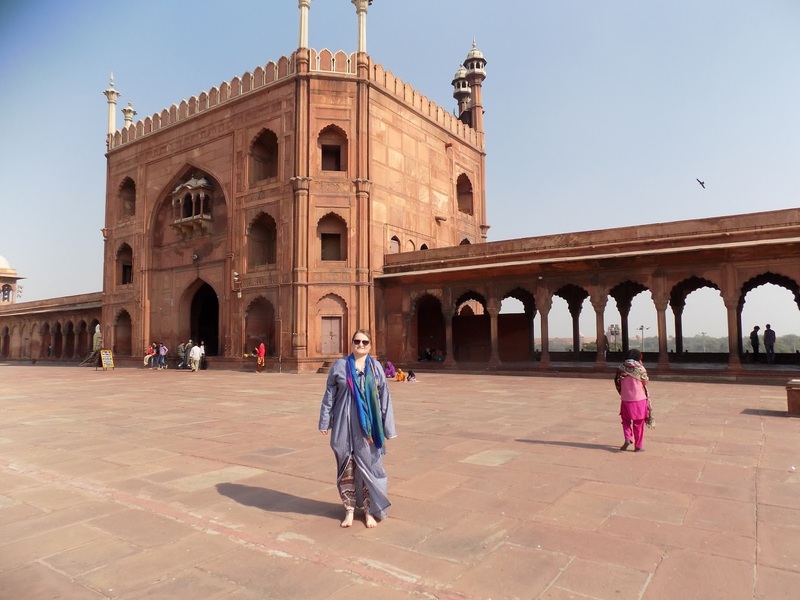 When we entered the Mosque, even though I was modestly dressed in trousers, a long sleeved blouse and a scarf, I was given a long garment to cover up and asked to take off my shoes. There was also a fee to bring my camera inside the Mosque. It was a beautiful day and in the courtyard of the Mosque people were praying peacefully. 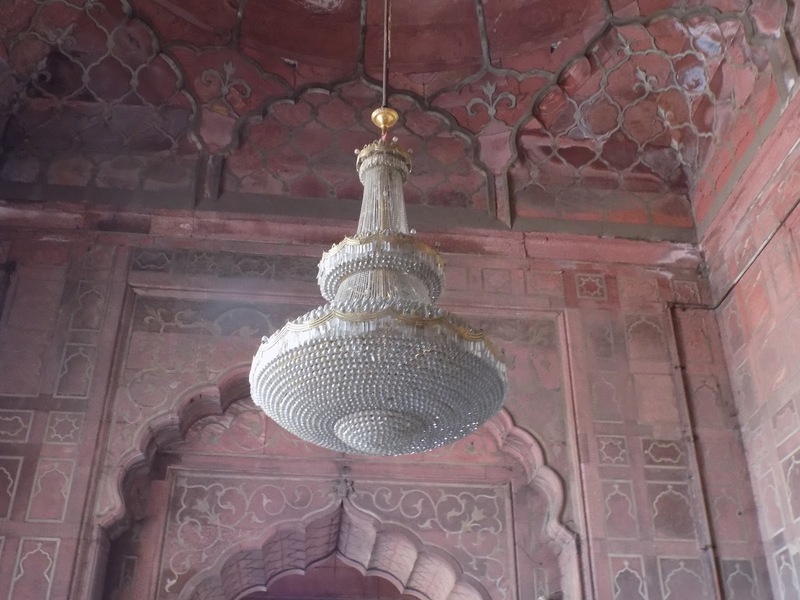 The inside of the building featured a rather mismatched chandelier. It was very unusual for me to see that there were certain parts of the Mosque that I was not allowed to visit as I was a woman. In other areas women were only allowed to enter when accompanied by a man, so sadly I didn’t get to experience the full grandeur of the building. I did find it to be a very peaceful place and spent some time watching the birds circle the mosque. But because of the element of exclusion I felt as a woman I found it hard to relate on a spiritual level. 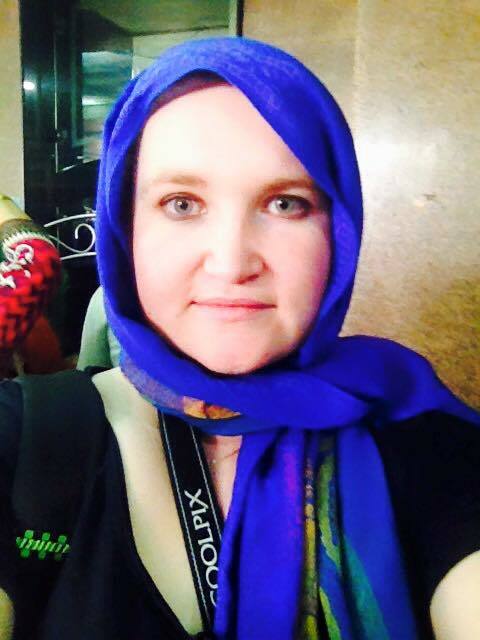 A far more spiritual experience for me was a visit to the Gurudwara Bangla Sahib, Temple in Delhi. Again, we were required to remove our shoes and cover our head on entering the temple. The complex was really well set up for visitors with an area to leave your shoes and scarves for those who had none. 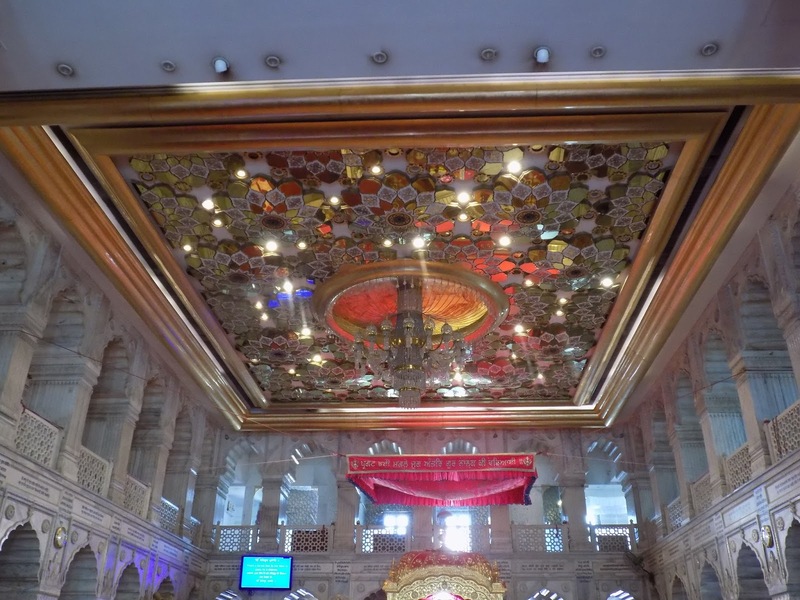 The temple itself is built with beautiful white marble with gold and mirrored ceilings throughout. Inside the sound of drums and singing added to the atmosphere. 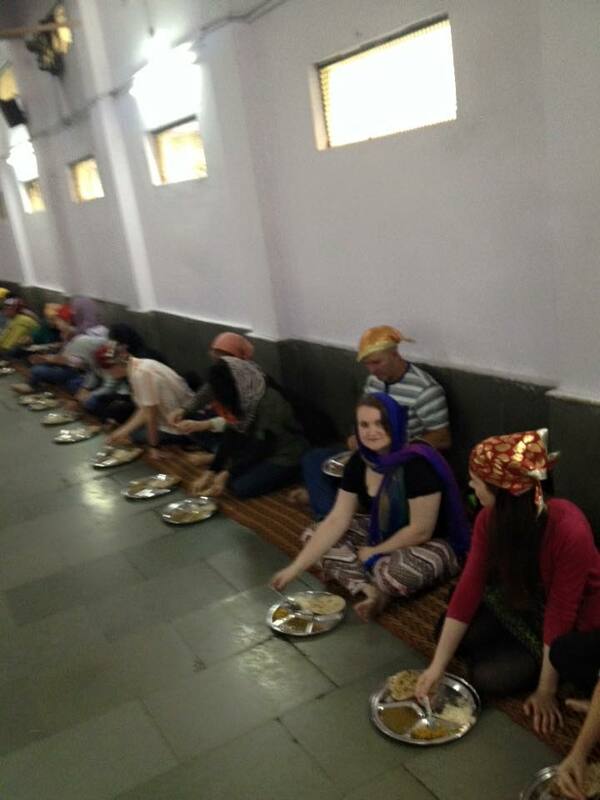 I was really excited at the prospect of volunteering in the kitchen in the Gurudwara Temple. Our guide explained to us the concept of Langar, which is an element of Sikhism where a common kitchen serves food to visitors for free regardless of their religion, background, social or economic status. Only vegetarian food is served, to ensure that all people can eat in the free kitchen. I absolutely loved this concept, whereby local people could come inside and have a free meal and everyone eats together. To earn some good Karma you can also volunteer to cook in the kitchen or donate food such as bags of rice or whatever you can afford. 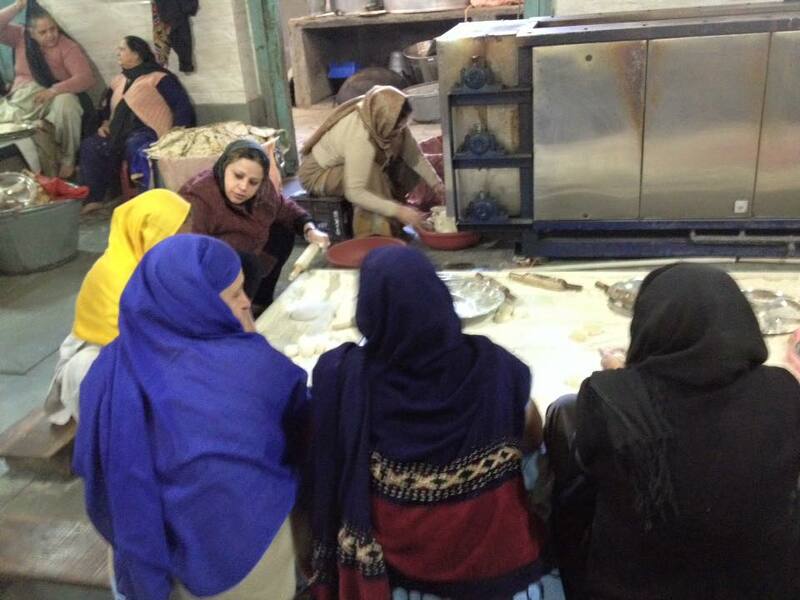 I was so happy to be invited to volunteer in the kitchen and also learned how to make naan bread with the local women. 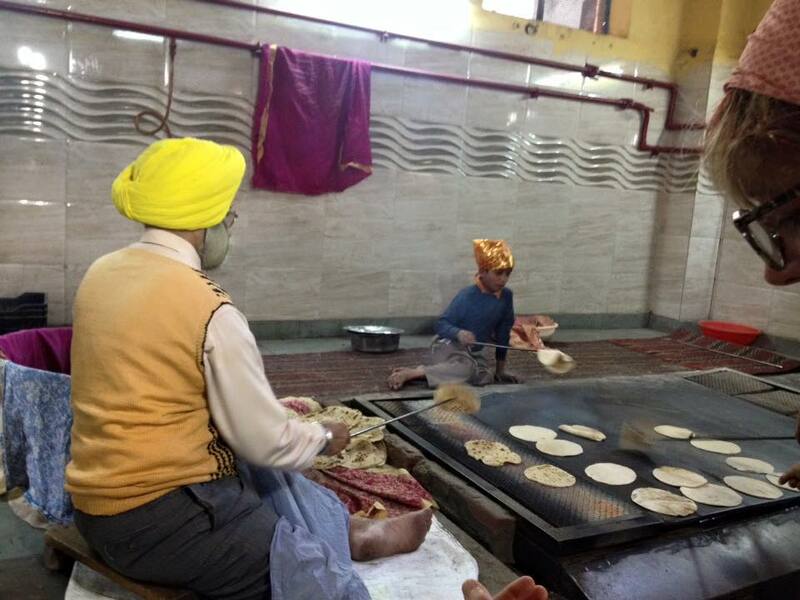 The Gurudwara Kitchen can feed up to 15,000 people in a day, so it was a fast paced environment and I found that my naan making skills where not a patch on the women here. After the kitchen we were invited to eat lunch which was an honour. I have been on the underground in many European countries and I am always fascinated by it. The underground in Delhi was even more fascinating. Firstly, the level of security was incredible with metal detectors and X Ray machines making riding the subway not unlike boarding a plane! Another interesting thing about the underground in Delhi is that there are two separate carriages for men and for women. This is a response to the safety issues for women. I did feel a little bad that the women’s coach was near empty and you could see that the men were wedged into the other carriage. While walking back to the hotel from the underground station I witnessed a lot of children begging and living on the street. 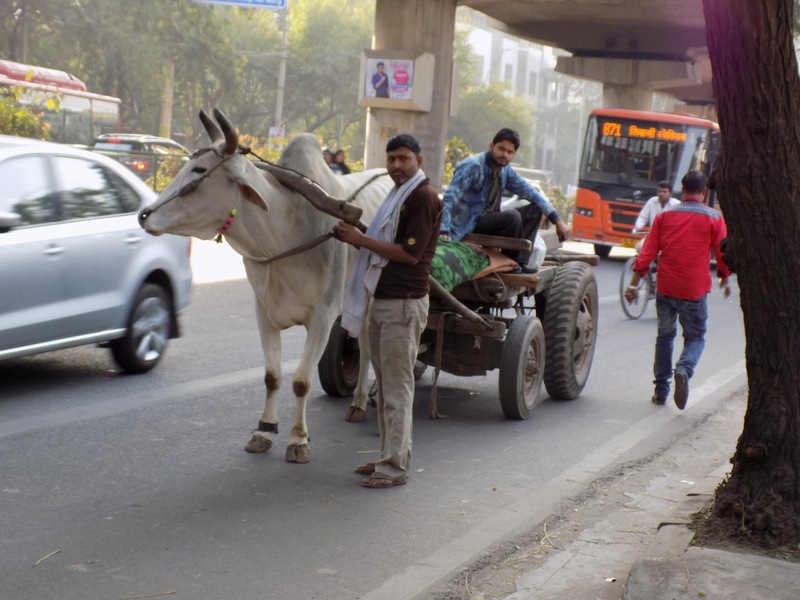 This was a very humbling experience and I began to think of all of the things I had seen during my time in Delhi.The differences between the tiers in society are still very big here. I also noticed the men on the motorways with animals and carts riding alongside cars and buses. Delhi was a mind-blowing experience bringing both good and bad emotions. From a very young age my grandmother would take me to local markets at the weekend. 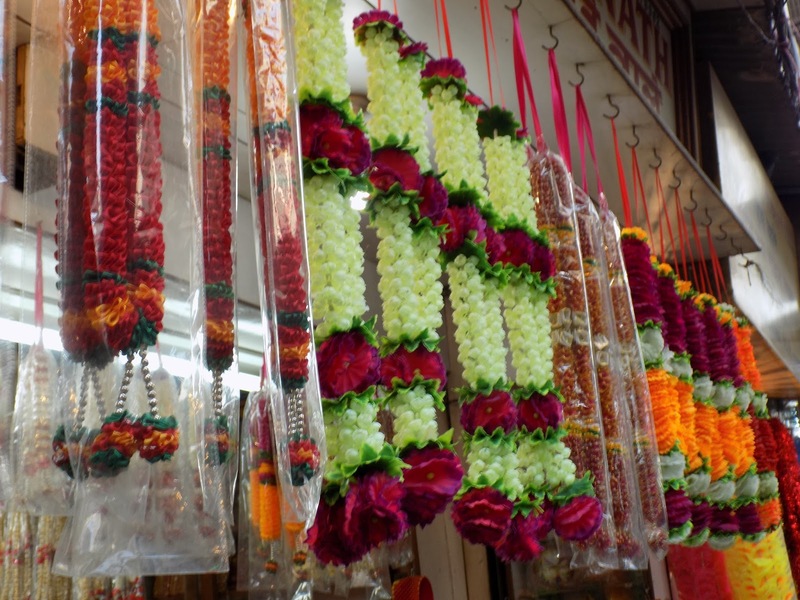 Ever since, I have loved going to markets when I travel. I adore the unusual items for sale and enjoy the hustle and bustle of the place. 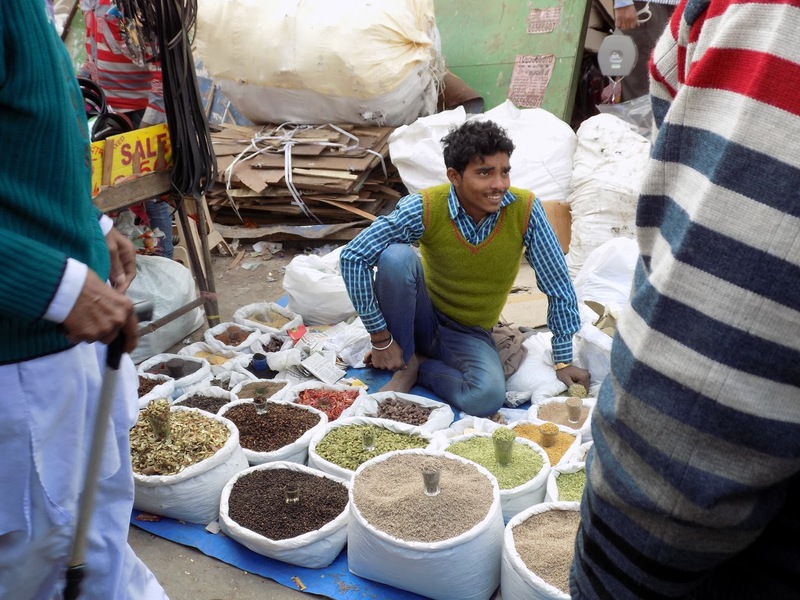 While in Delhi I visited some spice markets and took in the colour and scents of fresh ginger and turmeric and cardamom. 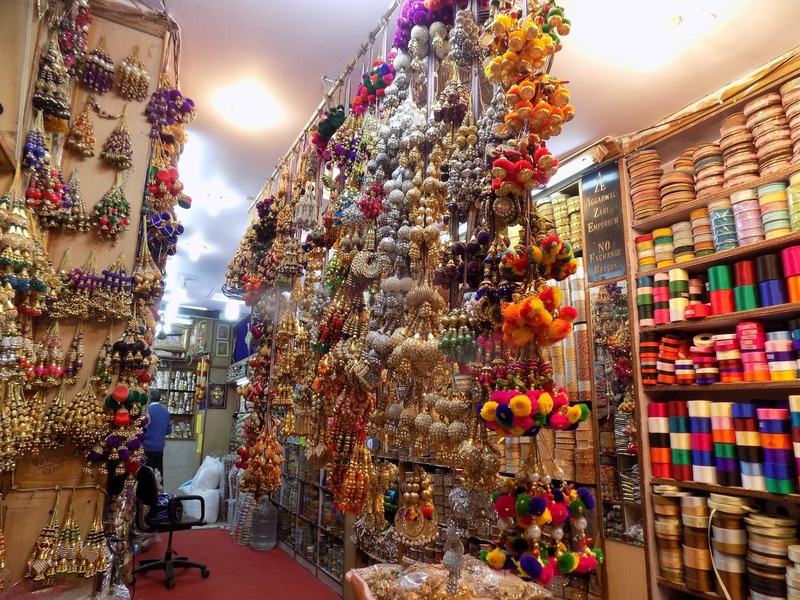 I also wandered through the old fashion district of Chandi Chowk, a half mile long bazaar selling the most beautiful and colourful embroidery and fashion items. I learned that all of the store owners hung lime and chili from the door of their shop to promote good luck and prosperity. Well I couldn’t possibly write about Delhi and not mention the food! I tried mainly vegetarian food with Aloo Gobi a spicy cauliflower dish and lots of Paneer, which is a type of cubed cheese used in curries and salads. I will be writing much more about food as I continue to write about my adventures in India. Delhi was an eye opening, jaw dropping introduction to the incredible country that is India. It is true that they say it is an assault on the senses. It was loud and colourful and filled with images I will never forget, both good and bad. But the time had come to leave and I was off to my next location, the Pink City of Jaipur! What a beautiful post. An extensive account filled with awesome travel photos that capture the daily life in Delhi. India is such a charming country, I'd love to visit someday. This was such a nice and informative post. I have not thought about going to India but after reading this, I made up my mind that I ought to plan a trip there in this lifetime. I am now fascinated with their culture and of course, the gastro-adventures. 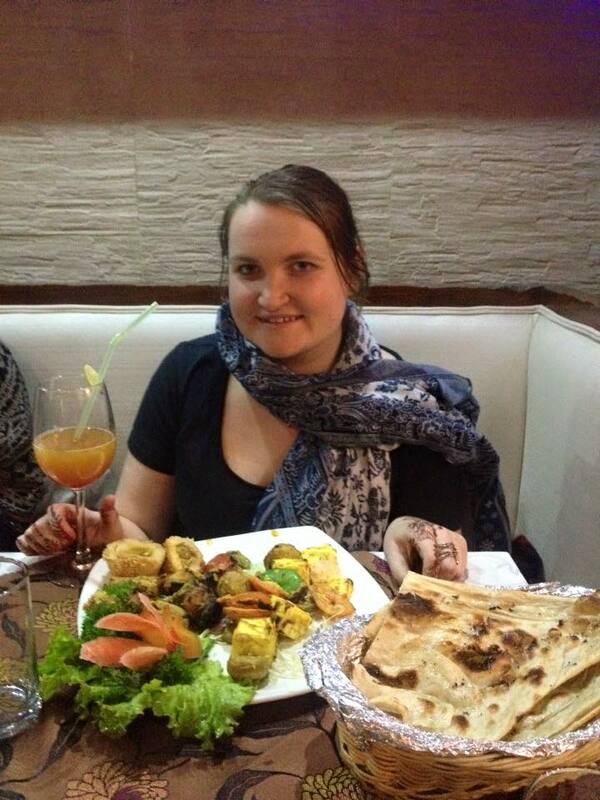 I am a fan of Indian Food. So you saw a lot in delhi. Think you got a good guide. 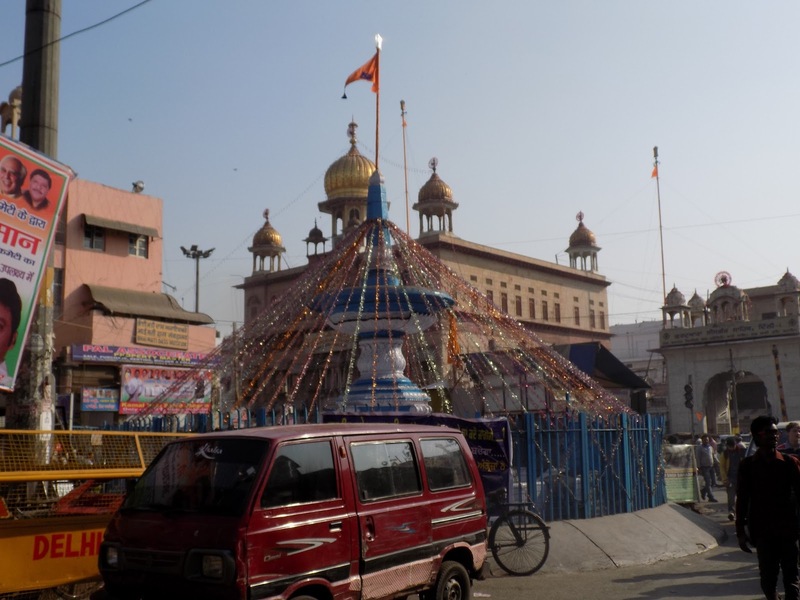 Chandni chawk, bangla saheb and jama masjid are must to visit. Could you go to canaught place, khan market, India gate? Lemme know when you are in India next time. Sure looks beautiful. Love your pictures. I would definitely love to visit and explore Delhi myself one day. Looks like I'll have a great time doing so. I'd love to explore their food more. 🙂 Thanks for sharing!